I was recently given an old 2 cycle LawnBoy push mower that is solely electric start. There is just one slight issue, it needs a replacement battery. I say a problem because I may have to resort to eBay to purchase one (75.00+11.00 shipping) if I ever want to use the mower. It uses a series of 6-2 volt cells to equal 12 volts at 2.5 AH. I took the battery to my local Interstate battery shop since they deal in all sorts of rechargeable batteries, but the guy had never seen anything like it before. I left it there over the weekend to see if they could get it or find something similar. If they can't or if it's the same as the eBay price I was just curious if any of you have seen anything like it before, and possibly know where else I could get one? I'd even consider using a battery that is equal in power and size if cheaper. I'd say it's about 3" wide by about 4" long. 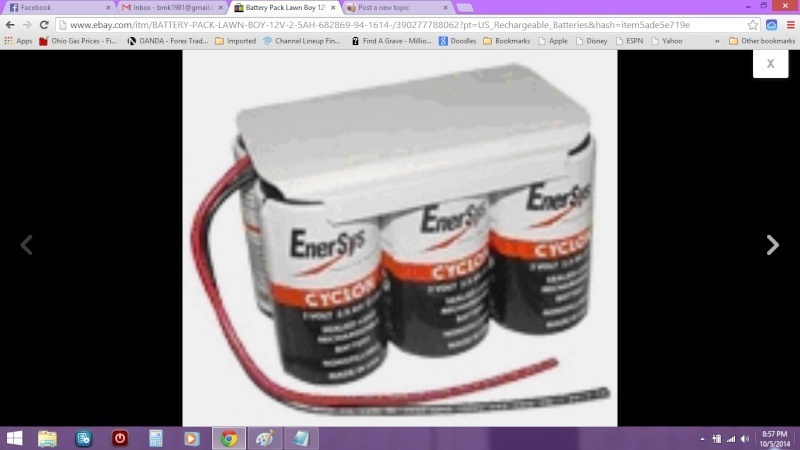 Here is a image of the battery: Thanks. It can't be converted to recoil type cranking??? I do not believe so. Even if it could, it would likely be more difficult than locating a battery. I believe Toro took over for LawnBoy in the early 1990's and that means i'd have to contact a Toro dealer and their is only 1 near me and I imagine going to them will be expensive. I'm hoping to hear back from Interstate today, since they didn't contact me yesterday. And now you know why you received the mower for free! I'm sure it's a small gel-cell battery and you should be able to find something close for a little less money. I would at the very least start the mower with another battery to make sure it's worth the investment of a new battery. MEZLAW wrote: And now you know why you received the mower for free! Ask your dealer if he can get a powersonic battery. Even if you have to fabricate a tray to hold the battery it would be worth it. This is how companies do now , make specialized parts so you give up fixing it. Here is a link to a similar PS battery. I use a lot of these at work for UP supplies. MY local electronics place has them and can order different sizes or shapes for usually around 15 bucks on average. Is there a BatteriesPlus near you? I know they carry the individual cells that pack is made up of. tuberadiogeek wrote: I do not believe so. Even if it could, it would likely be more difficult than locating a battery. I believe Toro took over for LawnBoy in the early 1990's and that means i'd have to contact a Toro dealer and their is only 1 near me and I imagine going to them will be expensive. I'm hoping to hear back from Interstate today, since they didn't contact me yesterday. If you can get the mower model number & serial number, and/or ..... if the engine has a model, spec/code & serial that you can pass on to me, I can tell you if recoil start parts are available. Interstate called me and said he could only order individual cells at 10.00 each, which is basically what I expected to hear but I figured I'd try them though. I have another battery supplier in town but they will likely tell me the same thing. My brother gave me the mower for helping him change out an outlet on the outside of his mobile home. He said he last had it running about 6 months ago, and ran with no issues. I don't have any other 12 volt battery besides my car battery. I do have a battery charger that does 10 amps, would that start it without damage? I looked at sealed rechargeable batteries on eBay and it's about 30.00 for an 8Ah one, which the guy at Interstate said each one of the cells were 2Ah which would be 12 total. The only problem is IDK the physical size of them. I'm going to look at the ones Interstate has, as they are about the same price as eBay. Those powersonic batteries are a bit large physically and a bit small in capacity, i'd be charging it almost constantly. I only have Interstate and Battery Warehouse locally, battery warehouse could likely also get the cells, but they are going to be pricey. The Model # R8035AE Serial # D273C0432 That is the model and serial number off of the deck. I would ask the battery folks for the closest size, voltage and capacity battery they have. You could get the cyclon batteries and assemble a pack easily enough but the cells I see run about $16 per and that would take the shine off the good fortune getting the lawn mower would give you. Ask them about the type cells they use for mobility carts. From what I see in the parts breakdown, this is a basic "F" series Lawnboy two-stroke engine. As long as the flywheel has the ring gear teeth cast into the bottom of the flywheel, a recoil starter from a non-electric start engine should fit. You could probably recycle that contraption and get enough money to buy the beer and entice a buddy to mow the yard for you! I will see about getting the closest size, I believe he said on the phone they carry 8 Ah batteries, which I believe would suffice easily seeing as it's only operating a starter momentarily. I will remove the top and look at the flywheel sometime. It's not about needing a mower, as I have 2 other running mowers. A older and newer one both with 3-3.5 HP Briggs engines on them. Plus one other for parts that I removed the head from, but could easily repair it by putting a new head gasket on it. I like the lawn boy 2 stroke engines as they are tougher than the 4 stroke briggs engines plus this one is also self-propelled. It has rollers that engage and drive the rear wheels. My yard is long,wide, uneven and a pain in the rear to mow sometimes so a self propelled mower will make it easier on my back to mow. I've screwed up my back numerous times mowing.. If worse comes to worse, You could just take the battery to the mower to start it, then set it aside after you start it. 75X11 wrote: If worse comes to worse, You could just take the battery to the mower to start it, then set it aside after you start it. I got the battery from Interstate today and looked at what they had in that general size. They run from 17.00-25.00 and from 1.3-3.0 AH, I'm just not sure if even a 3 AH would be large enough Bc I believe each 2 volt cell is rated at 2.5 AH. I'm going to get a little automatic float charger from harbor freight that does 15 volts at half an amp while it's on sale for 6.00 and see if the old battery will take a charge. If the old cells have a date code, they usually last for 3 to 4 years. If The other means don't work, 35Z5's idea of using a portable jump starter sounds like a good idea. There are some numbers stamped on the bottom but I can't read them due to partial fading. I imagine they are original to the mower which is likely over 25 years old. When I checked the voltage last week it still had 11 volts. I imagine it should have 13 or 14 volts fully charged. I tried to find out how much current a small starter like that pulls but couldn't find anything. tuberadiogeek wrote: I tried to find out how much current a small starter like that pulls but couldn't find anything. If you want to find out quickly and have an ammeter that would measure that large a draw, you could use your car's battery to crank it and see. Well, after 6 months of sitting, I got a battery for it. I ordered a 7 AH for it. The original one was only 2.5 AH not 12 AH like I thought. Could of bought an exact replacement for around 100.00 at a Toro dealer locally. I was originally going to get a 5 AH but a 7 was only 3.00 more. I spent 14.00 on it but over half was credit from eBay bucks I built up buying other stuff. Anyways, hooked up the battery using the connector from the old battery and put alligator clips on it. It cranked over nicely and after numerous primes it fired right up and ran quite nicely. It will make mowing a lot nicer since it's electric start and self-propelled. You need to buy a lottery ticket. You are the luckiest guy on earth if that thing actually started and ran well. Good job! Right. I figured if it didn't run I'd have a 12 volt battery on hand to power a phone charger or similar in the event of a power outage. I figured a 7AH would be able to do that for quite a few hours or even power a small corded spotlight periodically. Anytime I get something for nothing, that is usually what it is worth. Glad you got that worked out! After all the calculating, ya gotta put the stakes on the line and roll the dice. It's good your good judgement won out!